As a graduate, you automatically enjoy lifelong membership in the Saint Leo University Alumni Association, and access to the latest benefits and services. We encourage you to take full advantage of everything offered. For questions or assistance with alumni benefits, please contact the Office of Alumni Engagement and Sustained Giving at (352) 588-8667 or engagement.giving@saintleo.edu. The Saint Leo University Alumni Association offers members special discounts and money-saving opportunities through various affinity partners. Special GEICO Auto Insurance Discount: Saint Leo Alumni Association members could receive a special discount on GEICO auto insurance. Visit geico.com/alum/saintleo, call 1-800-368-2734 or stop by a local GEICO office to find out how much you could save today! Make sure to mention your Saint Leo affiliation when you call GEICO to be eligible for the special discount. Saint Leo Career Services offers a wide array of in-person and online resources, services and programming to empower alumni with the knowledge and skills needed to successfully navigate the job search or career transition experience. Visit the Office of Career Services at University Campus in Kirk Hall or contact your career counseling team at (352) 588-8346 to learn what opportunities await you. Request forms may be submitted by fax to (352) 588-8390. The Registrar’s Office can help any answer questions. eTranscripts are also available for $10. It is the responsibility of the transcript requestor to verify that the recipient will accept delivery of an Electronic PDF transcript before placing the order. You may purchase additional diploma copies. The fee for each diploma is $30, including mailing costs. Orders take approximately two weeks. Questions? Contact the Registrar’s Office. As an alumnus or alumna, you can encourage qualified students to apply to undergraduate programs at our University Campus, and offer to waive the student’s application fee. Simply download and complete the Admissions Application Fee Waiver form and have the student include it with his or her application. Saint Leo University alumni have the type of character and intellect that will stand out in a crowd - and now on the road! 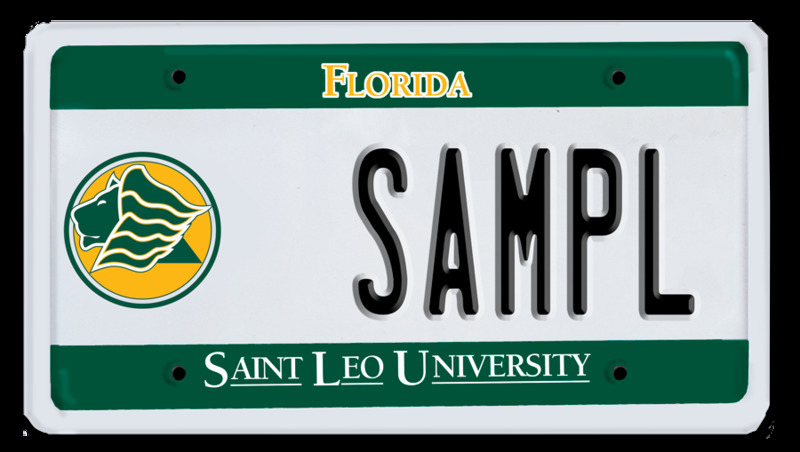 Saint Leo University is proud to offer the Lions Pride license plate through the Florida Department of Highway Safety and Motor Vehicles. The Lions Pride license plate, featuring the Saint Leo lion, is a great way to show your pride wherever you go! Best of all, proceeds from each purchase will go to help fund Saint Leo University student scholarships.